A Dismissed Lance Corporal, Emmanuel Anthony, yesterday confessed that he deserted the Army for fear of being killed by Boko Haram insurgents. He was paraded at the 81 Division headquarters in Lagos along with 12 others, including three dismissed personnel arrested for similar offences. 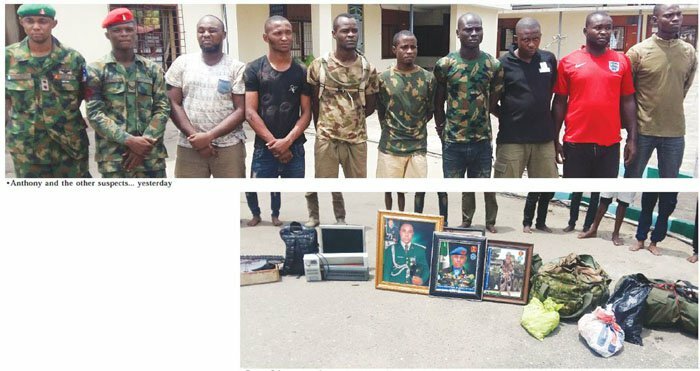 The suspects are Abdullahi Mubarak, Ibeh Emeka, Olasunkanmi Olamide, Godwin Emmanuel, Private Ahmed Yahaya, Ale Ayokunle, Robert Danang, Corporal Abubakar Suleiman, Private Ibrahim Isah, Monday Ogar, Emeka Stephen and Bala Gabriel. Anthony was alleged to have led a gang of fake soldiers, who had military uniforms, accoutrements, recruitment forms and identity cards in their possessions. According to him, he fled the army in 2016 when he was posted to the Northeast. He said: “I was a Lance Corporal. I deserted the army in 2016. I ran from the Northeast where I was deployed to fight Boko Haram. I was given two weeks pass to go and see my family but I did not return. “I went to Akwa Ibom State and stayed there for over a month. I was declared wanted and the army arrested me. I was punished and sent back to the Northeast but I fled. I was afraid and did not want to fight Boko Haram. “When I was dismissed, I decided to pretend to be an officer. I impersonated an Army Lieutenant. I bought the uniform and the rank. I did fake identity card and also printed pass forms which I usually filled and stamped each time I went out to show any personnel who checked me. 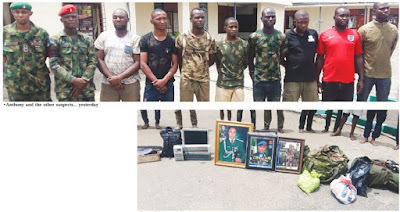 The Nation reports that the General Officer Commanding (GOC) 81 Division, Maj.-Gen. Enobong Udo, said the suspects were arrested at different locations within Lagos and Ogun states. Udo, who was represented by the division’s Chief Staff Officer (COS), Brig.-Gen. Hamisu Hassan, said they had apprehended no fewer than 36 impostors since January, adding that 23 had been handed over to the police. He said there was a decline in cases of military impostors since the inception of ‘Operation Checkmate’. “It should be noted that these criminals are painting a bad image of the military and the Nigerian Army as they commit these criminal acts and give the impression of being bonafide personnel. “Abdullahi Mubarak was arrested on April 2, fully clad in military camouflage, red beret and a Military Police (MP) hand band in Ojo. He had fake military identity card with him. Emmanuel Anthony, a dismissed soldier, is the ring leader of the fake identity card producing syndicate. “He has also on various occasions impersonated as a Lieutenant, Captain and any other rank that suited his illegal activities. “Ibeh Emeka was arrested on April 3, at Alaba International Market. He is a member of Emmanuel Anthony’s syndicate. They have also worked together as impostors dressed in military uniforms. “Olasunkanmi Olamide from Adeoyo in Ibadan was arrested on March 18, in Shagamu for impersonation. He was dressed in military uniform. Godwin Emmanuel was arrested on March 18, while dressed in military camouflage t-shirt. “Another deserter, Private Ahmed Yahaya from 202 Battalion in Bama was arrested. He deserted in 2015 and was dismissed in September 2016. He was arrested on April 3 along Sabo-Sagamu road, Ikorodu while dressed in camouflage t-shirt. He was parading himself as a soldier to defraud law abiding citizens. “Ale Ayokunle, a resident of Hall Mark Estate, Fish Farm Bus Stop, was arrested on March 31, dressed in Nigerian Army camouflage uniform at Flower Market Odugunyan, Ikorodu. He was molesting and extorting money from innocent civilians. Robert Danang an impostor was arrested on April 3, at Sabo Market, Ikorodu dressed in Nigerian Army Strike Force camouflage jacket, parading himself as a soldier, defrauding and extorting innocent citizens. “A dismissed Nigerian Air Force (NAF) Regiment, Corporal Abubakar Suleiman, was arrested on April 4, for assaulting a Beninnois police officer at Assesse Junction, Lagos-Ibadan Expressway. He was dressed in Army faze cap claiming to be a serving personnel molesting innocent citizens. “Private Ibrahim Isah, a deserter from 149 Battalion Ojo, was arrested on April 5, at Ikorodu. He was dressed in military camouflage parading himself as a personnel while molesting and extorting innocent civilians. Monday Ogar was arrested on February 9, along Mile 2 – Badagry Expressway. He was wearing a camouflage t-shirt and driving a Tokunbo vehicle that was to be delivered at United Legal Motors. “Emeka Stephen, a computer operator, also a member of Emmanuel Anthony’s syndicate, was arrested in Alaba International market on April 6. Bala Gabriel was arrested on April 2, dressed in military uniform in Ojo area. Udoh provided telephone numbers for reporting uniformed persons engaging in illegal acts. Ogun State 08053862233 and 08057705135."